Mish's Global Economic Trend Analysis: Existing Home Sales Bounce Essentially a Mirage; Supply Drops to 11-Year Low: Is that a Problem? 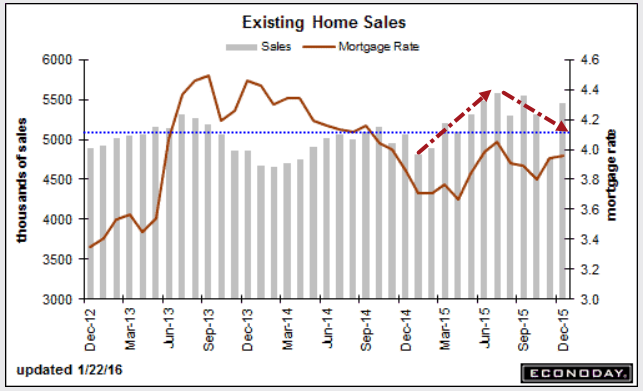 Existing Home Sales Bounce Essentially a Mirage; Supply Drops to 11-Year Low: Is that a Problem? December existing Home Sales bounced a whopping 14.7% from November's dismal showing. But most of that bounce is a mirage. Last month, new documentation rules pushed sales into December. Smoothing out the distortions, the average of the last two months was 5.11 million. That's well below the 5.43 average of the prior six months. So, there were indeed distortions last month, but there is also underlying weakness. Existing home sales bounced back sharply in December, up an outsized 14.7 percent to a 5.46 million annualized rate that just tops Econoday's top-end forecast. Year-on-year, sales are up 7.7 percent in a major contrast with the minus 3.8 percent rate of November. But November was an unusual month skewed lower by new documentation rules that pushed sales into December. Averaging the two months together shows a 5.11 million rate that is well below the 5.43 average of the prior six months. Total sales for 2015 came in at 5.26 million, well up from 4.94 million in 2014. Single-family homes led December's bounce, surging 16.1 percent to a 4.82 million rate and a 7.1 percent year-on-year gain. The trend for condos has been much stronger with the year-on-year gain at 12.3 percent and with monthly growth in December at 4.9 percent to a 0.640 million rate. Low supply in the market has been a big negative for sales and is a major concern in this report. Total homes on the market fell to 1.79 million from November's 2.04 million with supply relative to sales falling to only 3.9 months, far below 5.1 months in November and sizably below 4.4 months in December 2014. Supply right now of existing homes is as low as it's been in nearly 11 years, a factor the report warns that may slow sales during the spring. But low supply is a plus for prices where data in this report are firming. The median is up 1.9 percent in the month to $224,100 for a very respectable 7.6 percent year-on-year gain. Regional data show wide sales gains led by the West at 23.2 percent on the month followed by the South at 14.6 percent. Year-on-year, the Northeast is out in the lead at plus 11.9 percent followed by the Midwest at 9.9 percent. Housing is showing some life but gains, including those for new homes, are being held back by lack of supply. Still, price appreciation is a rising plus and is well above other price areas including wage growth. Is price appreciation a plus or a minus? Bloomberg says "price appreciation is a rising plus". I suggest that with every increase in price, homes become less and less affordable. Bloomberg says "Total homes on the market fell to 1.79 million from November's 2.04 million with supply relative to sales falling to only 3.9 months, far below 5.1 months in November." Why did supply relative to sales plunge? Because November sales were skewed to the downside and December to the upside. Expect a rebound in supply numbers next month. If you smooth the distortions, today's reported bounce is no more than a mirage.